Today I have another preview for you, it's Valentine - Who Cares? trend edition from Essence. I wanted to post some festive nails with glitters and some other festive things, but I only photographed two notd's and then my phone died. Now I have an older one and I can't photograph anything. I hope they will fix it so I can start blogging again. Always together: BFFs! 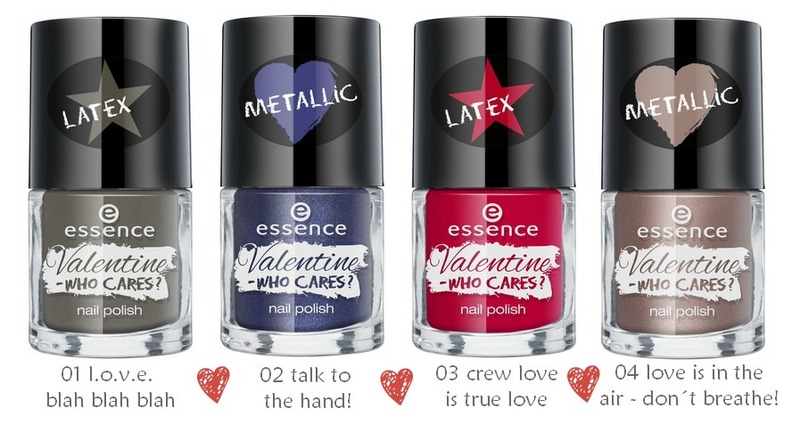 The new essence trend edition “valentine – who cares?” is welcoming a different kind of Valentine’s Day from mid January to mid February 2016. Wild, rebellious and casual, we’re breaking with old traditions and dedicating the day of love to best friends. This means: lots of fun and action for two! Edgy products in intensive colors like red, blue and black as well as metallic beige and khaki tones for strong styles. The favorites: the false lashes in two versions and the click & go nails with a stiletto design. 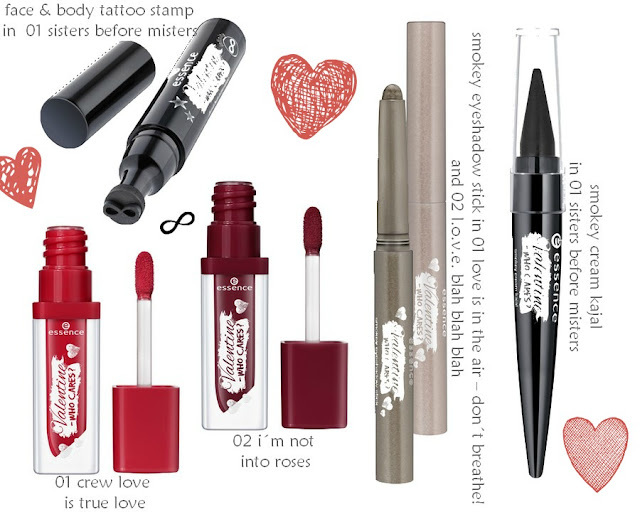 The face & body tattoo stamp with an infinity symbol creates a trendy BFF tattoo and the limited, fruity-sweet scent underlines the rebel queen slumbering within every girl. Sisters before misters… with essence! Face & body tattoo stamp: To infinity and beyond! All girls and their BFFs can design matching tattoos with the face & body tattoo stamp. Unlike the friendship, the stamped tattoo will only last a little while. Available in 01 sisters before misters. Liquid lipstick: Rockin΄ red. The liquid lipstick unites the coverage of a lipstick with the mirror shine of a gloss. In light and dark red for the ultimate wow-lips. Available in 01 crew love is true love and 02 i´m not into roses. Smokey eyeshadow stick: Smooth looks. The retractable cream eyeshadow pen is easy to apply and blend. For expressive smokey eyes in metallic beige or shimmering khaki. Available in 01 love is in the air – don´t breathe! and 02 l.o.v.e. blah blah blah. Smokey cream kajal: No limits. The creamy, easy-to-blend eyeliner with a tapered mine ensures exciting smokey eyes looks in intensive black. Thanks to the conic shape of the tip, there’s no need for a sharpener. Available in 01 sisters before misters. 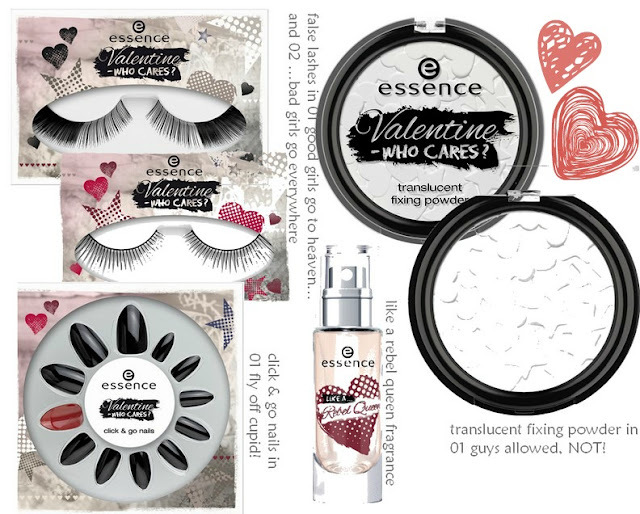 False lashes: Lashes in love! The false lashes in two unique versions – volume lashes and a lashline that becomes thicker at the ends – guarantee a dramatic, sultry look. Available in 01 good girls go to heaven… and 02 …bad girls go everywhere. Click & go nails: High-heels for nails. Make a true statement with the cool, almondshaped tips of the click & go nails in a stiletto design with black on top and red below. Simply select the desired size of the self-adhesive artificial nails and cause a sensation at the next party! Available in 01 fly off cupid!. Like a rebel queen fragrance: Wild thing. Fruity-sweet, fresh and cheeky, this fragrance is sure to awaken the rebel queen in all beauties and is reminiscent of fun times with your best friend. The sparkling top note contains tangerine, candy apple and pear, which unite with plum and roasted almonds in the middle note to give the scent a sweet touch. The base note with sandalwood, musk and licorice is as deep as a long friendship. Available in 10 ml. Translucent fixing powder: Heart-to-heart. The compact powder with a soft, transparent texture sets make-up in place and mattifies the complexion. With interlocking hearts and stars on the surface of the texture. Available in 01 guys allowed, NOT!. Nail polish: Nail crew! The four nail polishes – khaki and red with a semi-matt latex finish as well as blue and beige with metallic results – offer a combination of colors and effects that turn nails into eye-catchers. Available in 01 l.o.v.e. blah blah blah, 02 talk to the hand!, 03 crew love is true love and 04 love is in the air - don´t breathe!. Do you like this collection? Will you buy anything? Thank you for reading! Balea Advent Calendar + Giveaway!